We ALL have bad mom days. You're short with the kids. They cannot stop running around and screaming. Your toddler paints himself in poop while your preschooler breaks a toy. You just want to crawl under a rock and not come out for the rest of the day. 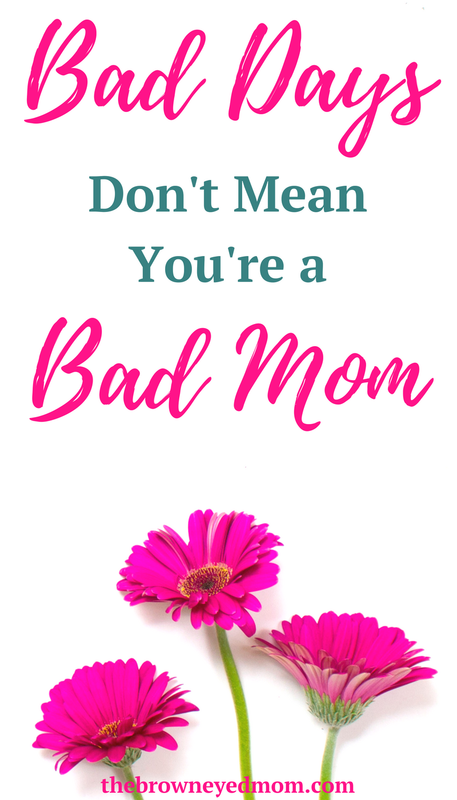 Just because you have a bad mom day doesn't mean you're a bad mom! I feel like I have at least one bad mom day a week. Sometimes a lot more than one. But I have to remind myself that it happens. I'm not a perfect mom and I'll never be a perfect mom. And no matter how another mom may look to you from the outside, she's really not the perfect mom either. As humans, we tend to compare ourselves and our lives to others. And as moms, we REALLY tend to compare our bad mom days to other mom's good days. While your kids are running a muck at the library while you whisper scream at them to get it together, you notice another mom with her angelic kids quietly reading and sitting down in the kid's section. You think to yourself "Wow, her kids are so well behaved! I bet she never has to get on to them!". But little do you know that an hour before your encounter at the library, that same mom had locked herself in the bathroom for 5 minutes because those same angelic children would not stop fighting with each other. Sometimes they happen more than we want them to or care to talk about it. They happen. But it doesn't mean you're a bad mom. In those moments, remember that we all have them and just because another mom looks like she's having a good mom day doesn't mean she never has a bad mom day.